“Durham’s Back Porch” will encourage visitors to cross the railroad tracks into downtown and activate the back sides of Main Street’s restaurants and bars. Iconic gateways will frame the four pedestrian intersections that bridge the gap visually between American Tobacco District and the City Center, encouraging movement and day/night activity. The back porch concept offers the retail and restaurant services an opportunity to create an eclectic gathering and outdoor eating corridor. Artistic paving and canopy structures would create a feeling of an outdoor marketplace. 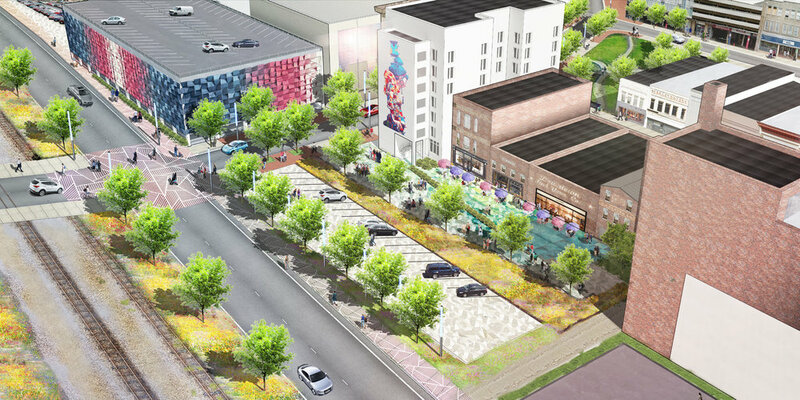 Street tree planting will further reinforce the connection , as will lighting to bring vibrancy, color and energy to the district. Facade art opportunities are highlighted on the buildings that frame the train tracks. The terrace can be divided into two plinths and steeped to offer a unique outdoor amphitheatre and gathering space.